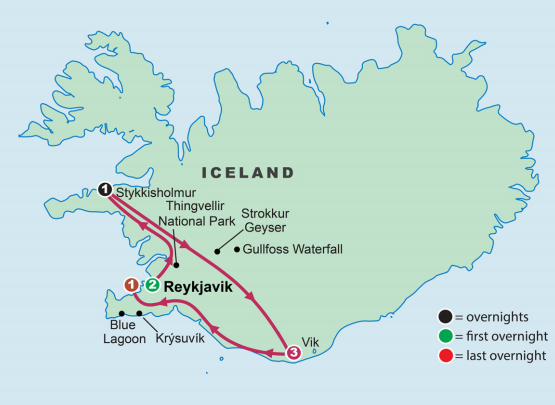 May 15-23, 2019 Explore the Land of Fire and Ice with Rev. Bill Wheeler. An island of dramatic contrasts, Iceland is a landscape forged by fire and ice. Steaming lava fields and hot pools reflect its volcanic nature, while massive glaciers continue to sculpt the mountains and valleys, leaving thundering waterfalls and plunging fjords. Travel the 'Golden Circle' where many natural scenic wonders are located. Stay overnight in a local fishing village to enjoy a scenic bay cruise. Create your own adventure with a choice of exciting activities: soak in the Blue Lagoon, or take a whale watching cruise; hike into a lava cave, or stroll along the coastal lava fields while admiring natural wildlife. Discover the spectacular landscapes and proud people of this small island nation during this fascinating journey. Prices from other cities available upon request. Prices are per person based on double occupancy. The supplement for a single room is $1050. This tour is not subject to GST/HST. Not Included: Meals not shown, Beverages, Items of a personal nature, Any airline luggage fees, Increases to surcharges, taxes or fees, Insurance. We set out on a journey full of dramatic contrasts. Come to know Iceland, a place where steaming lava fields reflect a volcanic nature and massive glaciers sculpt mountains and valleys, leaving thundering waterfalls and plunging fjords.